A 911 call was received from a frantic wife that stated her husband was having chest pain and difficulty breathing. The ambulance crew arrived and was unable to restart his heart, so a breathing tube was inserted so the patient could be transported to the closest hospital for further of care and evaluation. Typically, critical care patients in northwest Kansas are taken to a tertiary care by air transport. An air transport is about an hour and a ground transport from the region is typically at least three hours. Due to inclement weather, flying was not possible. The only option to get the patient to tertiary care was to transport via ground ambulance. The equipment received through a Dane G. Hansen Foundation grant that assisted in funding a new ambulance specially equipped for longer transports allowed an Intensive Care Unit level of care and monitoring so the Sherman County EMS crew could provide the patient the care he needed during the trip. The patient later returned home to his family and is forever grateful for the care that he received that day. The medical equipment played a valuable role in allowing the EMS crew the ability to raise the bar on ground transports for the entire region. 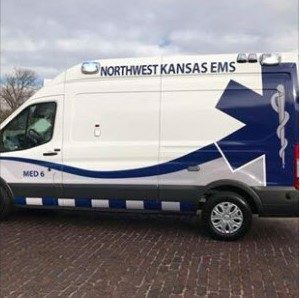 The Sherman County EMS has also been able to attract new staff and re-arrange scheduling so that it is able to dramatically decrease response time to calls for critical care transports.